I enjoyed looking through your site. Very nicely done and very informative. It is good to see a few sites from the U.S. extolling on the virtues of model boat building. Model boating has always been the "low man" on the totem pole of projects in most hobby shops, and little has been done to encourage folks to discover the pleasure and education that can be had with any good kit. The level of detail and the fun of creating it on a model is more like a mix of building a model railroad...and an R/C aircraft. With reasonable weight limitations, you can create a fantastic piece of work...and it comes to life on the water,...with less chance of "re-kiting" itself on impact...such as the planes often do. When I designed the original kit of Prime Time at Dumas, I used Formica to create a lot of the wood parts, then transferred the design to wood for the die-cut parts. As you know, the original yacht, known as "TIME", was built in the Palmer-Johnson shipyards in Wisconsin. At the time she was built, 1986, she was the largest aluminum yacht built in the United States. She was also the largest jet powered yacht at that time. It was not feasible to power a model this small with jets, so I designed the kit with a pair of rudders for simplicity. HOWEVER...you might have already discovered that by using split throttle, electronic throttle controls, that rudders are almost pointless. 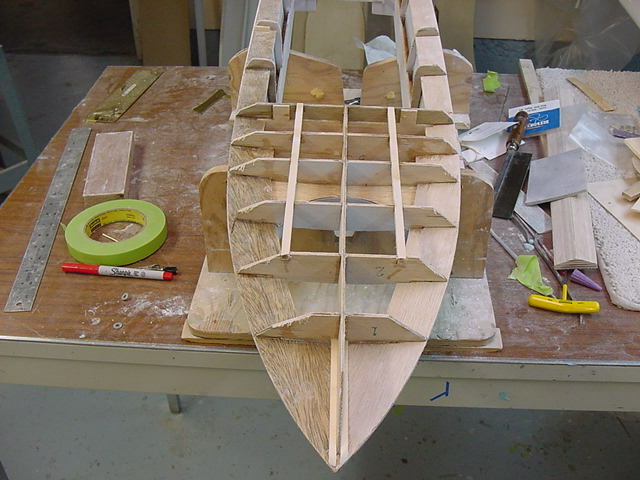 We have built a number of models that require no rudders. Just split throttle. And that's the way I am building the Prime Time model for our customer. Simple. More responsive, (especially in reverse!! ), and it eliminates the rudder & servo, thus eliminating the need for an access to the rudder area at the transom. As you have already noticed, the aft end of the Prime Time is VERY CLOSE to the water. Back this little jewel up with any gusto and you've got a basement full of water! There is tremendous advantage to being able to seal up the aft, stair-step decks to make her water tight. We were asked by the owners of the yacht, the Atwood family of Chicago, to not use the name TIME on the model, so, I came up with Prime Time. They loved it and everyone lived happily everafter. Seth Atwood has a fascination with time. He built the largest clock museum in the world, in Chicago. It has now been turned over to the city of Chicago. Seth Atwood, his interior decorating daughter, and Tom Fexas of Florida, designed the yacht at 126', and were all set to build an even larger version, 160'. The day that TIME was introduced to the world, is the same day that the stock market took its biggest plunge since 1929...and the project died on the vine. And now you know.....The rest of the story! Here are a few pix of the Prime Time kit that I designed when with Dumas. The one we just built has been modified a bit, as all yachts go through a face lift over the years. No rudders (just like the full-size which was jet powered) She steers like a champ just using split throttle motors with two electronic throttle controls. If you like, I'll send you more photos of her as completely finished..just a couple of days now! Well, Roger, I had better get back to work, but it has been enjoyable talking about boats, and I look forward to seeing more on your well-done web site.